(Phys.org) —Thermometry – the measurement of temperature – is critical to a wide range of applications, including many industrial processes, biomedical monitoring, and environmental regulatory systems. However, measuring temperature in the presence of high RF (radio frequency) or other electromagnetic fields – such as are found in aerospace, automotive and medical systems – cannot be accomplished using electrical thermometric probes. In these cases, optical sensors that allow scientists to perform thermometry based on thermally-driven changes in ﬂuorescence (brightness) are the instrument of choice. While typical ﬂuorescence thermometers use millimeter-scale optical probes, smaller devices are needed to measure temperatures in intracellular and other nanoscale environments. As a result, the field has witnessed the development of nanoscale ﬂuorescence thermometers based on quantum dots, rare-earth ions and nanogels. Recently, scientists at the University of California, Santa Barbara, Ames Laboratory, and the University of Chicago have demonstrated extremely sensitive ﬂuorescence thermometry techniques based on nitrogen vacancy (NV) centers in diamond – paramagnetic defects in which electron spins can be manipulated at room temperature by applying a combination of microwave radiation and light. This results in sharp resonances in the defects' photoluminescence intensity as a function of the frequency of the microwave radiation, with the frequency dependent on external variables such as magnetic fields, electric fields, and, in this work, temperature. 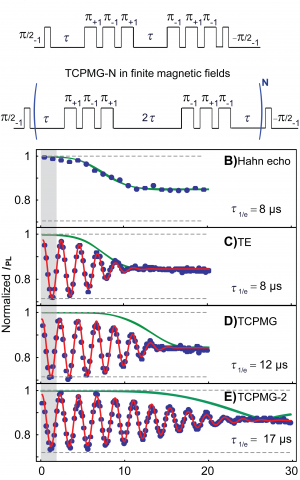 The researchers also showed that these techniques can be applied over a broad temperature range and in both finite and near-zero magnetic field environments, suggesting that single spin quantum coherence could be leveraged for sensitive thermometry in a broad range of biological and microscale systems. Prof. David D. Awschalom discusses the research that he, graduate students David M. Toyli, Charles F. de las Casas, David J. Christle, and Ames Laboratory scientist Viatcheslav V. Dobrovitski conducted. While Awschalom tells Phys.org that fluorescence thermometry is a well-established technique, and that millimeter-scale fluorescence thermometers are mature technologies, most recently-developed nanoscale optical probes lack sufficient sensitivity for intracellular thermometry and other target applications. 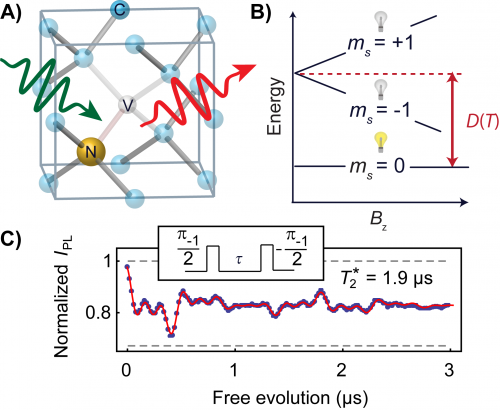 However, Awschalom notes that the researchers' new approach leverages the fact that the diamond NV center's fluorescence correlates with the quantum state of its intrinsic magnetic moment, or spin, to achieve much better thermal sensitivities than are offered by conventional approaches. The scientists also demonstrated that their techniques are extremely versatile, in that that they can be applied over a broad temperature range spanning room temperature to 500 Kelvin (440° Fahrenheit), as well as in both finite and near-zero magnetic field environments. "It's quite unique to have a technology that operates based on the principles of quantum physics at these temperatures," notes Awschalom, "since most quantum devices are restricted to operate only near absolute zero." Moreover, he points out, it may be possible in future experiments to use the NV center as a multifunctional probe capable of measuring both magnetic fields and temperature. "Just ten years ago the idea of using single spins for sensing applications at 500 Kelvin was probably unthinkable," says Awschalom. "These scientific studies have now advanced to the point where we can start to apply these new quantum technologies to a variety of challenging and compelling applications." As mentioned above, a key innovation that fueled their research, notes Awschalom, was working with Dobrovitski in developing protocols for manipulating the NV center's spin that mitigate its interactions with its magnetic environment while maintaining sensitivity to thermally induced changes in the spin states. As the magnetic environment is the primary noise source in these measurements, mitigating its effects allowed them to convert small changes in temperature into large changes in NV center's fluorescence. "The idea of using the quantum states of a single spin for thermometry is very exciting," says Toyli. "What we're really doing is adapting ideas from quantum information science to enable sensitive temperature measurements at the nanoscale." In addition, the researchers' findings suggest that the quantum coherence of single spins could be practically leveraged for sensitive thermometry in a wide variety of biological and microscale systems, such as probing intracellular thermal gradients. "Our work showed that one can use an atomic-scale impurity in diamond to measure temperature shifts of much less than 0.1 K through the defect's fluorescence. If similar results could be obtained with NV centers in nanoscale volumes of diamond – that is, in nanodiamonds – then this would enable sensitive thermometry in a wide variety of biological and microscale systems." In such a system, Awschalom explains, the sensor's spatial resolution is defined by the size of the nanodiamonds, which have been shown to have NV centers in particles as small as five nanometers. Diamond's properties – biocompatibility, mechanical hardness and high thermal conductivity – make this system a very promising thermal sensor. "One can imagine applications where nanodiamonds are inserted into living cells and used to image intrinsic thermal gradients, introduced into microfluidic circuits and used to monitor the temperature of chemical reactions in the circuits," Awschalom illustrates, "or where NV centers are incorporated in nanoscale pillars as part of a scanning probe system – as are already being built for magnetometry applications – and used to map out thermal gradients on a surface." Looking forward, says Awschalom, a primary challenge for the field is to achieve better spin properties for NV centers in nanodiamonds, since these typically have comparably worse properties than the NV centers in bulk diamond studied in this work. However, while conventional nanodiamond fabrication methods are quite crude, Awschalom notes that recent advances suggest it may be possible to use top-down-fabrication methods to produce nanodiamonds with high-quality spins. The researchers are also focused on optimizing the delivery of the gigahertz-frequency magnetic fields used to manipulate the spin in order to minimize unintentional heating of fluidic samples. "We're excited by the prospect of applying spin-based thermometers in a variety of applications," Awschalom concludes. "Specific examples include not just noninvasive thermometry in cellular and microfluidic environments, but also high-temperature scanning thermal microscopy." This is fantastic material! I have been contemplating macro molecular structures, covelent bonds and their applications towards new technologies. The properties of covelent bonds are fascinating to me. There are implications there that I haven't fully grasped as of yet. It is wonderful to come across other thoughts along the lines of this new Quantum applied science! Thanks for the GREAT articles!